This is our most popular model. They offer both easy length adjustment and a quick release. The buckle material is Acetyl (the DuPont version is called Delrin) which provides a strong, lightweight product with improved UV resistance over other plastics. We use the new contoured buckle which does not have all the squared off corners of the traditional side release buckle. Webbing is polypropylene which will not absorb water and is resistant to both mildew and rot. 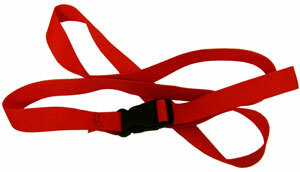 We also manufacture these straps in ¾" 1" 1½" 2" widths. Choose the length and your price will show here.